Welcome to PlayBiz, a practical online guide that helps you navigate your way through preparing your child to start their school journey by developing the essential skills they need. The first 5 years of your little one’s life are crucial. 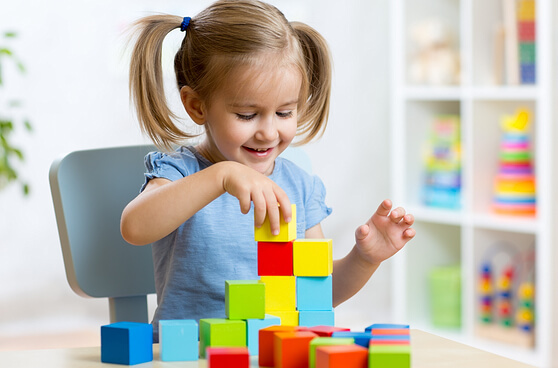 Simply put, how kids progress developmentally during this time sets the tone for their learning and development throughout school and beyond. The impact of this development isn’t just limited to academic learning, but also their health and wellbeing, social skills, emotional health, mental skills and language skills. It’s the time in their life where kids learn the most at the fastest rate, like little sponges absorbing the world around them 24/7. And if you’ve ever had little miss or mister cheekily parrot something you’ve said or done you’ll know what we’re talking about! We want each and every child to have the most enjoyable, beneficial and successful school experience they can possibly have. That’s why we’ve put together a toolbox of practical, easy-to-use strategies, activities and tips that will help you develop your youngster’s foundation skills – the skills they need to develop for school-based tasks such as reading, writing and playing sport. With PlayBiz, you can support junior to start school ready to learn in leaps and bounds for just $94.95 (for 3 months subscription)! PlayBiz is specially designed so your little miss or mister’s development is supported, in a way that is engaging and actually fun!! It’s your roadmap to their school journey, so you don’t have to stress about taking a wrong turn and ending up in Timbucktoo. We’ll get you both where you need to go. Better yet, all of PlayBiz’s activities and strategies make the most of your scallywag’s naturally playful and curious ways. To your youngster PlayBiz feels like fun play and quality time with a loved one. Meanwhile you’re safe in the knowledge that junior is learning important skills while they enjoy themselves! Thanks to being a nanny and a mum, I totally get the headache involved in ‘household logistics’. I know all about the need for credible and practical information that I can easily use, amidst the chaos of running a household and juggling absolutely everything a day, week, month, year can bring. That’s why all of PlayBiz’s activities can be easily incorporated into your daily routine and the countless things you have to tick of your list. So much so that soon they’ll become second nature! And if that wasn’t enough, everything ‘PlayBiz’ can be created in your own home using household materials, so there’s no need to rush out and spend unnecessary money. Private experts in childhood development can be costly and public development centres may have frustrating waitlists of 6–12 months. That’s why I set about creating PlayBiz, my step-by-step guide for supporting your little one’s development to give them their best start to school and a positive early education experience – the benefits of which will echo throughout their life. Becoming a PlayBiz member costs just $94.95 and lasts for 3 months. This is an awesome investment in giving your child an excellent start to their school life (and life life!) and supporting a happy, successful early learning experience. Also, rest assured, PlayBiz’s resources are reliable. It all stems from my extensive clinical experience as an occupational therapist working with pint-sized humans. Everything you’ll find on PlayBiz has been trialled and tested by us in many forms – we know you only want the best for your child and so do we. Here at PlayBiz, we like to walk our ’socially conscious’ talk and are donating supporters of charities that give disadvantaged kids and their families access to much-needed educational programs and resources. Find out more about our social responsibility through the PlayBiz Charity page. It is super important to understand and accept that the content may not work for an individual child and is not a guarantee that your child will be 'school ready' by a certain age. Also, this website and the information provided is not intended to be a substitute for a consultation with a qualified health practitioner. Are free to be a kid and have fun! Feel free to jump right ahead to the Foundation Skills instead though if that tickles your fancy! I’m so excited to share this awesome time in your little one’s life with you and help you strengthen and shape the person they’re becoming. Enjoy PlayBiz and don’t forget: little skills shape big futures!